What's It Really Like To Teach English In Japan? Wondering what it is like to teach English in Japan? Super. You are in the right place. In this post I'll talk about the culture, the environment, the teaching scene and share some video interviews with teachers in Japan. I'll also be doing some comparison to some other Eastern Asian countries like Korea, Taiwan and China. "So in Japan having a debate is a really big issue. So it's totally different. Like in America we like to argue all the time. But in Japan people don't. Some Japanese students find it easier to debate in a different language like English. So that is always interesting to see. So that is what I like, different experiences." You'll hear more from Jeanie and other teachers in Japan later. But now we'll talk a bit about teaching in Japan. Japan is by far the most formal place to teach. Many schools will expect you to dress in a suit and tie. You'll have the most freedom here. In Japan your employer is not connected to your visa. This means that if you quit your job, you can keep the visa and ﬁnd a new job without having to leave the country to get a new visa. In the other places the employer basically owns your visa and that makes changing your job more difficult. You can also change the status of your visa in country. For example, if you enter on a tourist visa and find a job you can change it to an employment visa. In China, Korea and Taiwan you can't typically do that you have to leave the country for a visa run to get a new visa. Japan is by far the cleanest place to live in East Asia. The streets are pretty clean and there seems to be a greater awareness about the environment here than in the other places. For example, public bus drivers will turn off the buses at red lights to conserve resources. You won't find that in other parts of East Asia which is generally crowded and polluted. You'll see a far greater array of fashion styles in Japan than in the other countries. Self expression seems to be more acceptable here than in the other places. Japan has also started a number of trends in Asia, like for example anime and cosplay. You'll also ﬁnd a greater diversity of music styles here. In the other three locations you'll ﬁnd mostly mainstream pop music. Japan is hip. Japan was the ﬁrst country in Asia to embrace Hip Hop. 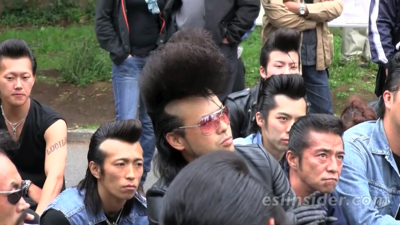 You'll also ﬁnd Elvis Presley imitators, low riders, and their own unique styles like Cosplay. Japan is also the most modern and westernized. It is a wealthy country - the third largest economy in the world, but it's considerably smaller than China or the USA. The level of comfort here will be the highest. The people here are generally very polite and well mannered. If someone bumps into you, you'll most likely get an apology or two. This is different compared to other countries like China or Korea where pushing can be common especially among older folks. As Jeanie say in the picture above people don't like to debate. Most East Asians don't like confrontation and that's part of the culture. Japan lies in the Ring of Fire. Making it a very active place with many earthquakes and volcanoes. Taiwan also lies within this area. There are many bikes in Japan. People of all age groups ride pedal bikes. You won't see many pedal bikes in China, Taiwan or Korea, but here bikes are aplenty. I am a fan of Japan. I like the vibe. I haven't lived there yet and I know that that is a different experience from just traveling to a place, however, I truly enjoyed my time there. I have spent time in Fukuoka (on multiple visa runs from Korea) and in Tokyo and I give it 2 thumbs up. Teachers in Japan talk deep stuff: The banana game, debating, ups & downs and then answer the question, "Is Japan foreign friendly?" Japan vs. Korea - Where should I teach?